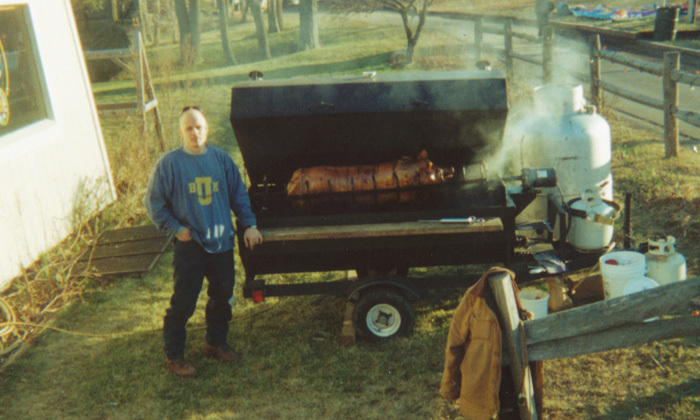 My first memory of BBQ goes back many years to around 1982. I was 10 years old. My Nana and Poppy would host the annual Fowler family lamb roast. Nana's cousin Bobby had a farm in Vermont and would raise a special lamb every year. 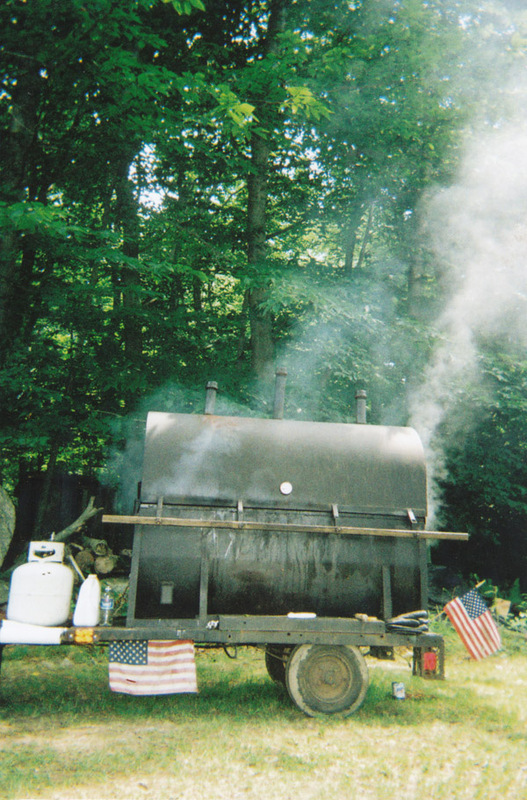 On the Friday before the Saturday roast, Uncle Bobby would set up his homemade BBQ pits that were pretty unique. 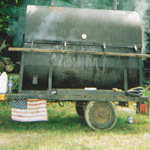 They took two hours to set up and used hardwood charcoal for smoke. Starting at first light on Saturday morning, Bobby and his BBQ crew would get the coals just right before starting the lamb. Cooking the lamb all day required constant basting. His baste was a mix of Burgundy wine, butter, garlic, saltand pepper. Using paint brushes I would help in the basting process. Finally at 4:00 p.m. Bobby would slice the lamb very carefully with his special knives. The whole family would dig in. I can still remember how the thin pieces would melt in your mouth. 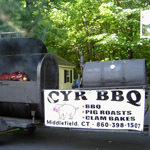 Some years later the Cyr side of my family decided to have a pig roast for their annual family reunion. I had to borrow a rotisserie and ended up burning the pig to a crisp. The following year I decided to rent a smoker. It cost $250 a day and I needed it for 2 days. 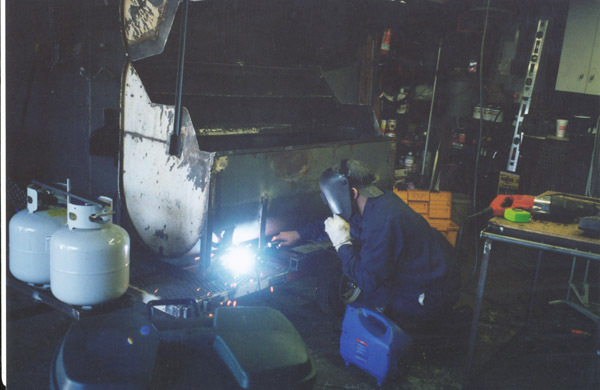 The cooker was a gas fired roaster with a lid - much better than the first rotisserie but far from perfect. 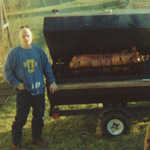 Soon after the reunion some friends asked if I would cook them a pig. I agreed and rented the unit again. After a sleepless night in my tent constantly watching this pig smoker in their backyard, I decided to design my own smoker. I asked my friend Mike to help me build a custom pigsmoker. 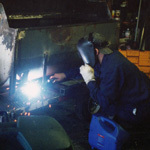 We had to purchase a welder and some metal but soon we were creating a real easy to use BBQ pit. After loading it on and off a landscaper buddy's trailer a few times, I decided to permanently mount the whole thing on its own little trailer, making it totally mobile. The design was great. After many years that first model is still one of my standard cooking units. Working as a restaurant chef / manager for years helped me with the recipes and customer service. Using many unique spices combined with the sweet apple smoke I am able to create a product that is hard to duplicate. Following years of "Saturday off" requests, I had to leave the hot kitchens behind to work outside for myself. Thanks to Don Carfi at Meadow Meat in Middletown, I was able to order high grade meats locally. He also allowed me to start a credit account with him. I had to gain his trust, but once my reputation began to grow we developed a great relationship. He told me not to grow too big too fast, and liked the fact that I was trying to make my own company from scratch. Without Don in those early years, I would have never been able to get where I am now. After 10 years and thousands of pounds of meat, I still order all my meat and fish from Meadow Meat in Middletown. Starting this business has changed my life for the better. I now get the recognition I never got working for other people. I can also provide the personal service missing in most restaurants - helping to make a wedding special or bringing a pig roast to a company picnic is very rewarding. 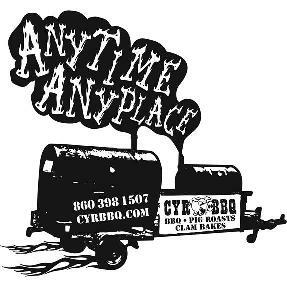 In the years to come I hope to provide my service to many more people who never knew they could have the whole hog and great BBQ delivered to their own special events. Thanks to all my past clients, and welcome to any in the future.